1. Add slaw dressing to cabbage and let sit. 2. Heat pulled chicken in a microwave, in a pot or by cooking in barely simmering water in the vacuum-sealed bag. 3. 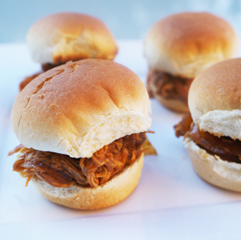 Slice Hawaiian rolls horizontally. Separate meat into 12 equal parts, approximately 2 ounces each (just under a quarter of a cup). Serve chicken on rolls. The Southern tradition is to eat the cole slaw on the sandwich, but you can eat it on the side if you prefer. This entry was posted in Recipes, Sandwiches. Bookmark the permalink. So fast to prepare and my kids all asked for second helpings.